2 Ye LP, Zhang Yu Y, Mao XL et al. Submucosal tunneling endoscopic resection for small upper gastrointestinal subepithelial tumors originating from the muscularis propria layer. 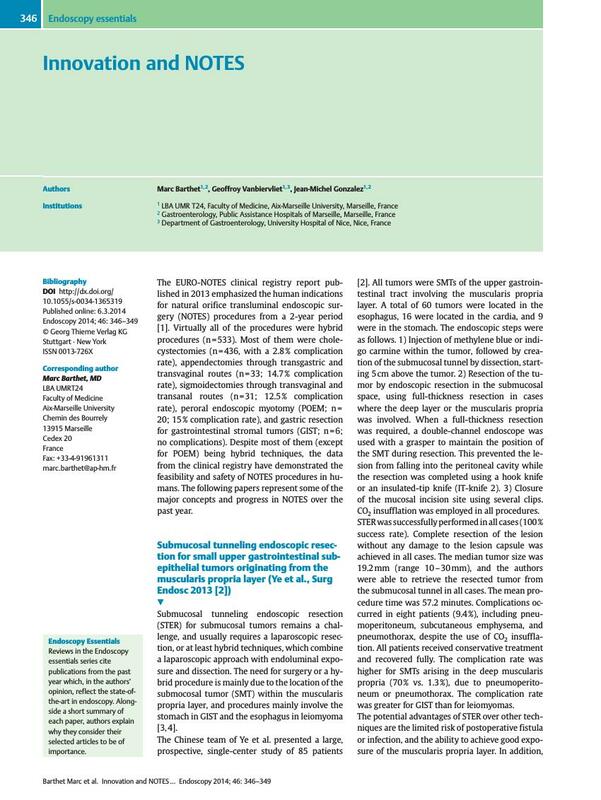 Surg Endosc 2013; [Epub ahead of print] DOI: 10.1007/s00464-013-3197-8. 9 Vanbiervliet G, Gonzalez JM, Bonin E et al. Gastrojejunal anastomosis exclusively using the NOTES technique in live pigs: a feasibility and reliability study. Surg Innov 2013; [Epub ahead of print] DOI: 10.1177/1553350613508016. 13 Vanbiervliet G, Garces-Duran R, Garnier E et al. NOTES gastroenteric anastomosis using a tissue apposing stent: a reproducible and efficient technique in live pigs. United Eur Gastroenterol J 2013; 1: A41 DOI: 10.1177/2050640613502899.